In this blog post we’ll illustrate how London Heathrow Airport successfully deployed its loyalty program through PassKit technology. 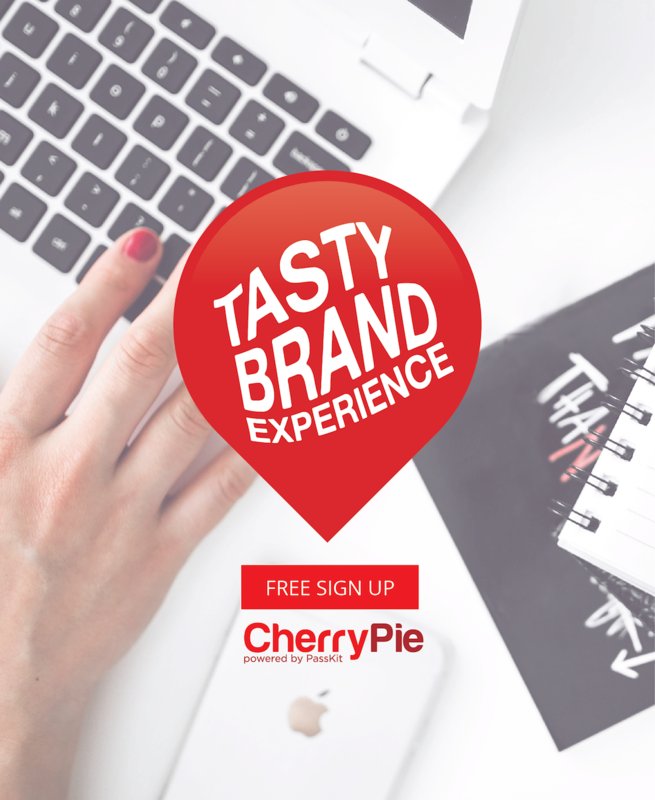 The digital loyalty program generated an average of 1245 new signups per day. By digitising the loyalty program, Heathrow Airport opened a new communication channel with the travellers by directly getting into their phones. Push updates, offers and loyalty campaigns in collaboration with merchants became easier to implement and deploy. 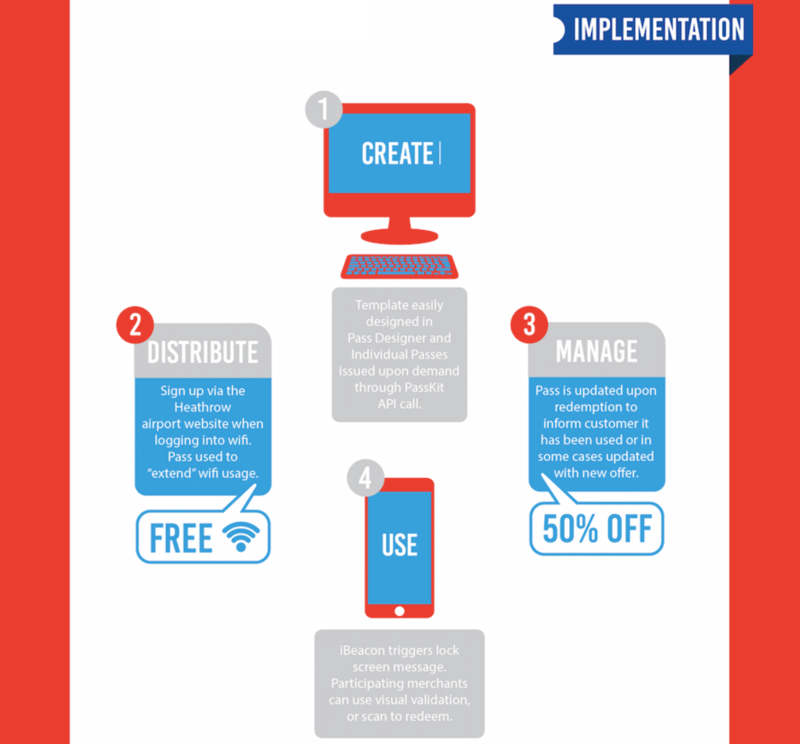 Creating and managing a loyalty program based on mobile wallet technology. Convey the image of Heathrow as an early adopter of technology, as well as an innovative airport aiming to enhance the customer experience through the latest available technologies. 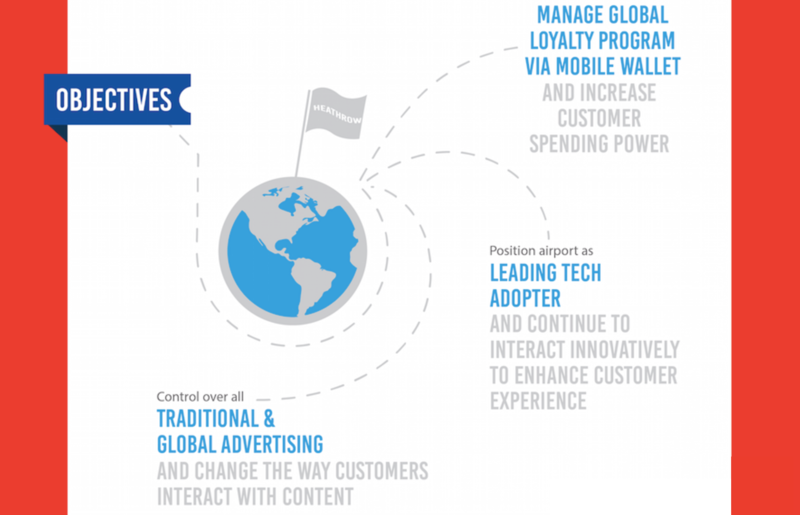 Fundamentally change the way customers (travellers) interact with content and advertising. Creation: First and foremost, Heathrow simply designed its own Loyalty Card through the PassKit online tools. Distribution: Secondly, the digital cards had to be distributed to travellers. In order to do so, Heathrow linked the loyalty cards to the airport Wi-Fi system. This way, travellers who wanted to use the free Wi-Fi over a certain limit of time, also had to install the loyalty passes in their phones. NOTE: Please take a look at How To Promote Mobile Wallet Content Online and Offline. Management: After redemption, pass automatically updates. Traveller is also informed about his or her redemption and pass changes into new offer (see also Forever Coupons). Trigger action: Beacon technology triggers lock screen messages to incentivise travellers to make a purchase or take a specific action. Participating merchants can validate coupons and offers through visual redemption or a scanning device. Traveler logs-in with airport Wi-Fi (if loyalty card is already installed in the phone, it can be used without internet. However, in case of dynamic updates the phone needs to have internet connection. In absence of internet, changes will occur next time phone has connection). After X amount of time, traveler receives and installs pass to extend Wi-Fi usage. Traveller receives push notification with an offer through beacon technology. Customer redeems the offer at the designated location. 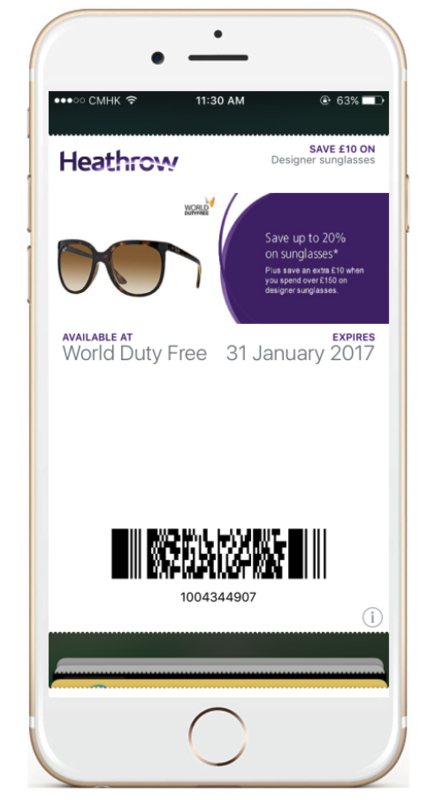 In the screenshot below you can see an example with the latest available coupon through the Heathrow digital loyalty program. It consists of a 10£ discount on designer sunglasses at World Duty Free. Better brand recognition for merchants as well as for Heathrow airport, and happy customers for special and convenient offers. 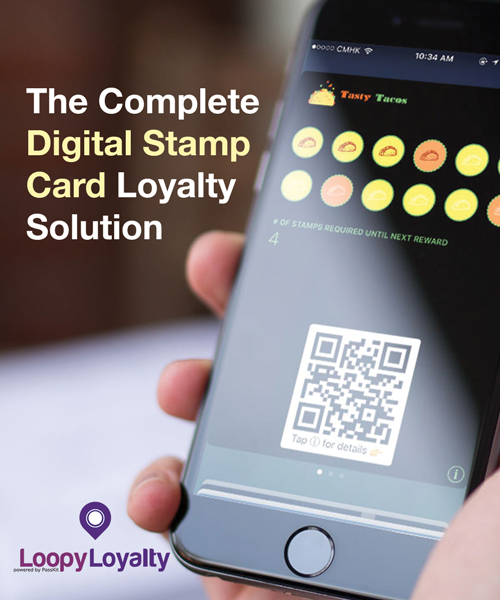 Consequent high demand for digital loyalty cards from merchants linked to the Heathrow loyalty pass. Beacon-triggered actions for travellers in terminal 2. After the implementation and once the campaign was fully live, Heathrow started gaining an outstanding 1245 additional members per day on average. Did you like what you just read? Would you like to implement a similar solution? Please don’t hesitate to get in touch, you can contact us here. Also, if you have any feedback or question feel free to leave a comment in the comment section below.